Cattle dealers in Benue say their business is on the verge of collapse because of the anti-open grazing law, which comes into effect on Wednesday. 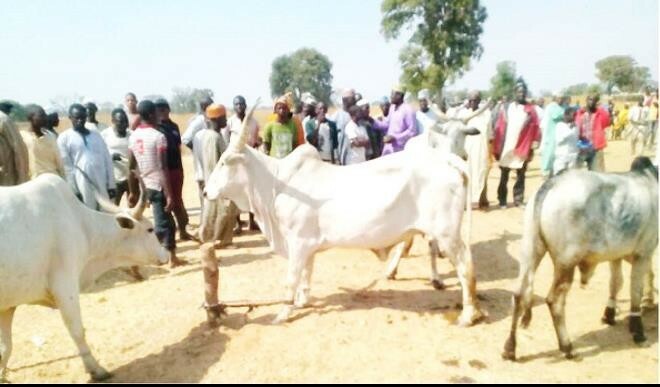 Some officials of the Cattle Dealers Association of Nigeria made the claim, while speaking with News Agency of Nigeria (NAN) in Makurdi on Wednesday. They said that the law failed to differentiate between herdsmen and cattle dealers, adding that action had consequently affected the business of cattle dealers. Alhaji Mustapha Aliyu, the chief of the main cattle market in Makurdi, said that cattle dealers in the market had lost over 10 cattle, excluding the calves. “The cattle have no water to drink, no food for them. The situation is particularly harrowing for the pregnant ones that are about to deliver. Most of the dead ones are the pregnant cows who couldn’t cope with the situation,’’ he said. He said that the cattle were going through tough times, adding that if nothing was done to salvage the situation on time, the cattle would all perish. Aliyu alleged that a member of his association was arrested in the Gbajimba neighbourhood for flouting the law, adding that he was later released after paying some fine. He said that 10 other cattle locations in the state were sealed by members of vigilante groups and moaned that hoodlums had taken undue advantage of the law to extort money from herdsmen and cattle dealers. He noted that the vast lands allocated to the cattle dealers during the administration of ex-Gov. George Akume were encroached upon, adding that the lands had shrunk from 113 hectares to only 12 hectares. Another official, Suleiman Ahmad, said that top government officials had brought their cattle to the market for rearing at one time or the other. He said that some of the officials were even members of the Gov. Samuel Ortom’s administration. Ahmad wondered why the government failed to consider the interests of cattle dealers when the law was being conceived, saying that cattle dealers were not herdsmen but businessmen who had contributed a lot to the growth of the state’s economy. He said that the market had a population of about 5,000 cattle, with over 200 cattle owners. Ahmad said that the law would destroy all the cattle and make the cattle owners to lose their livelihood. He recalled that the cattle market was established by the Federal Government during the tenure of the Akume-administration between 1999 and 2007. Another member of the association, Yusuf Mohammed, said that the cost of keeping cattle in a ranch might be too excessive for those involved in the cattle trade. He said that the government’s decision to include trade cattle in the open range cattle grazing prohibition law was aimed at destroying the business of cattle dealers. However, Mr George Ibese, the Commandant of the Vigilante Group in Benue, denied the claims that some cattle markets were closed, saying that the vigilantes only went to the markets to explain the law to the dealers. He also denied the allegation that a cattle dealer was arrested and ordered to pay a fine. He, however, conceded that three herdsmen from Shendam, who were passing through the state, were arrested by the vigilantes and handed over the police. Ibese said that the herdsmen were later escorted out of Gbajimba to Daudu on the outskirts of the state, prior to their return to their base in Shendam.